On the latest stop on his blog tour, author Jerome Charyn joins the show to talk about his new novel, The Perilous Adventures of the Cowboy King: A Novel of Teddy Roosevelt and His Times (Liveright Publishing). We get into the image that inspired the book, the challenges & rewards of historical fiction, and the quest to separate Teddy Roosevelt’s myth from his story. Along the way, we get into ping pong, whether LeBron James should have gone somewhere besides LA, the magic of Allegra Kent & Balanchine’s ballet, the loneliness of Van Gogh’s garret, the joy of collaborating on graphic novels, and the miracle of Jerome becoming a writer. Leave a comment about this episode below to enter a raffle to win Jerome’s new book & a his earlier novel, I Am Abraham: A Novel of Lincoln and the Civil War ! Check out the rest of the blog tour in support of The Perilous Adventures of the Cowboy King! Give it a listen! 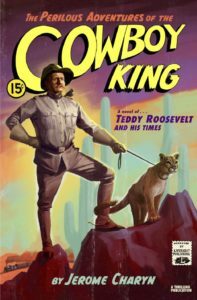 And go buy The Perilous Adventures of the Cowboy King: A Novel of Teddy Roosevelt and His Times ! 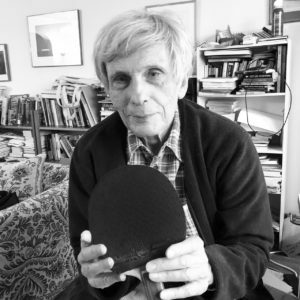 Jerome Charyn is an award-winning American author. With more than 50 published works, Charyn has earned a long-standing reputation as an inventive and prolific chronicler of real and imagined American life. Since the 1964 release of Charyn’s first novel, Once Upon a Droshky, he has published thirty novels, three memoirs, eight graphic novels, two books about film, short stories, plays, and works of non-fiction. Two of his memoirs were named New York TimesBook of the Year. Charyn has been a finalist for the PEN/Faulkner Award for Fiction. He received the Rosenthal Award from the American Academy of Arts and Letters and was named Commander of Arts and Letters by the French Minister of Culture. Charyn is Distinguished Professor Emeritus of Film Studies at the American University of Paris. Charyn lives in New York City. He’s currently working with artists Asaf and Tomer Hanuka on an animated television series based on his Isaac Sidel crime novels. Credits: This episode’s music is Fella by Hal Mayforth, used with permission from the artist. The conversation was recorded at Jerome’s apartment on a pair of Blue enCORE 200 Microphones feeding into a Zoom H5 digital recorder. I recorded the intro and outro on a Heil PR-40 Dynamic Studio Recording Microphone feeding into a Cloudlifter CL-1 and a Mackie Onyx Blackjack 2×2 USB Recording Interface . All processing and editing done in Adobe Audition CC . Photo of Jerome & racket by me. It’s on my instagram.